Roy Wood, ex-local band Mike Sheridan & The Night Riders, now called "Idle Race" is now playin' guitar in "The Move", which is is the greatest band in Birmingham and is enjoying Top 10 success. Roy Wood offers his friend Jeff Lynne, who joined the Idle Race after Roy Wood left the band and now is now the leader of The Move, a place in The Move, but Jeff Lynne chooses to stay with Idle Race. 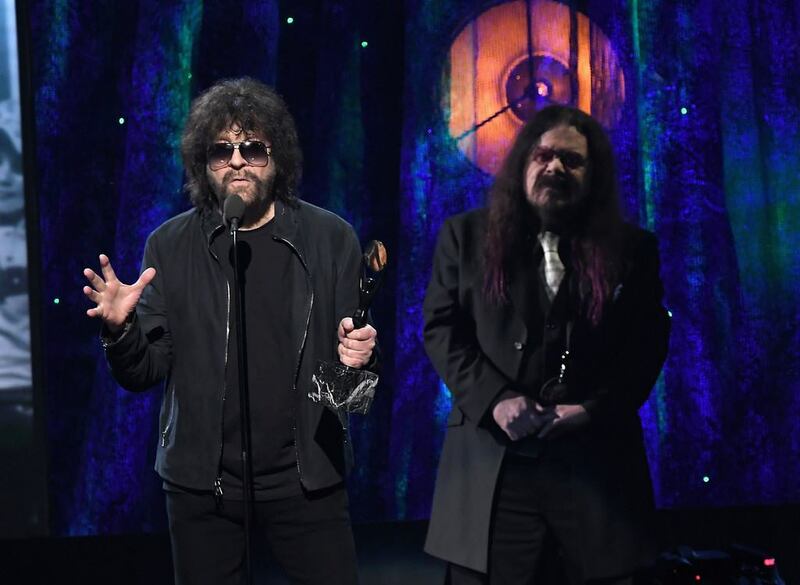 When Carl Wayne in January left The Move in favor of a solo cabaret and TV career (with moderate success "just not on board" during the 70s), initiations calms Jeff Lynne after another request to join The Move, but only if he also could be involved in Roy Wood's alternative band The Move. In the sense to that Roy Wood tries to play jazz and classical inspired free-form music, where the instruments looked more like an orchestra than a rock band. The whole idea was, financed by manager Don Arden which secured them a contract with Harvest. In January 1970 did Jeff Lynne leave "Idle Race" to play with "The Move" in their 4 line up (Rick Price bass / vocals, Roy Wood guitar / vocals, Bev Bevan drums) and with this crew 3 hits, but the peculiarity of the group was gradually disappeared and Roy Wood says: If it had been up to us (Roy Wood & Jeff Lynne) we had dissolved "The Move" immediately after Jeff Lynne joined the band, so we could concentrate 100% on "the Electric Light Orchestra"), but we were pressured not to do it !!! The plan for the first Electric Light Orchestra (ELO) release, exposed as "The Move" has several hits. "Tonight" / "Do not mess me up" published in June and achieves a 11 place in England in July. The 4'th album "Message from the country" published in June, but do not achieve chart success. The band moves to EMI's Harvest label, where Roy Wood and Jeff Lynne was producing together. "Chinatown" / "Down on the Bay" published in October and achieves an 230 place in England. After the US The tour in October pulls "The Move" retired from live performance (but still exists). Drummer Bev Bevan opend an record store in Birmingham. After October 1971, the "The Move" only experienced by TV performances and promotional singles. "The Electric Light Orchestra" sees the light of day in October 1971, the group 1 line up (Roy Wood cello, vocal, etc., Bill Hunt keyboards, french horn, Hugh McDowell cello, Bev Bevan drums / vocals, Jeff Lynne guitar / vocals, Richard Tandy bass / vocals (formerly "The Balls" "The Uglys"), Wilf Gibson violin, cello Andy Craig (leaving showbiz later)). December 15 they recorded 4 numbers for BBC sessions "Message from the country", "Words of aron", "Ben Crawley Steel Company" & "Ella James", the band consists of Jeff Lynne, Roy Wood & Bev Bevan as The Move. The session was broadcasted on the radio Dec. 23. In December was the debut album released, it's simply entitled "The Electric Light Orchestra". February 4'th Electric Light Orchestra recorded a BBC session of 4 numbers "10538 Overture", "Nellie takes here bow", "The battle of Marston Moor" "Whisper in the night". February 14 they played "10538 Overture", "Nellie takes here bow", "The battle of Marston Moor" on BBC radio. In March the first album was released in the US on the label United Artists. In the US they were trying to contact Don Arden for a proposed title for the album for the American market, but the secretary can not get through and wrote on a note, no answer, and it is published as "no answer" and achieves a 196 place. March 20 was "Whisper in the night" which was recorded a month ago played on the BBC radio. 16th of April, they provide their debut concert at The Fox and The Greyhound Pub in Park Laine in Croydon, London. Bev Bevan says: After the concert we were really very disappointed despite the fact that we had done everything so it should be good, but the tone by was lousy and there were up to 5 minutes between songs, when Roy Wood had to switch to another instrument, the audience was disappointed - it was crap! The concert cemented that "The Move" did not exist more! May 3 plays Jeff Lynne, Roy Wood and Bev Bevan "California man" as "The Move" on Top of the Pops, later that night, they play as ELO at The Drome in Brighton in England! The Move's last single "California man / Do Ya" is published and achieves 7th place in UK. Richard Tandy dropped the bass guitar and played then on keyboards and very occasionally guitar until 1986. Bill Hunt and Hugh McDowell was leaving the band. Colin Walker joined as cellist from July to September 1973. First single "10538 Overture" was published in July and achieves 9th place in UK Aug. 5. Debut album achieves 32 place in UK. Nick Mobbs who was boss of Harvest Records says that the band was too creativie for only one band, and they split the band in August, when Roy Wood surprises everyone to leave ELO to start "The Wizzard" and leaves Jeff Lynne as the leader of ELO as lead vocalist, lead guitarist, songwriter, producer and arranger. The 16th of August, ELO's new line-up made their debut at The Reading Festival in Berks, England. Jeff Lynne, Bev Bevan, Wilf Gibson, Richard Tandy, Michael de Albuquerque, Mike Edwards and Colin Walker. In November published The Move's last single "California man / Do Ya" in the US, but here are A & B side reversed and achieves a 93 place here. The forerunner of the second album was a top 10 hit, the "Roll of Beethoven" which was released in January (achieves 9th place in UK and 42 place on July 28 in the US) and it laid the economic foundation for their first US tour, where they began to lay the groundwork for future successes. The Move actually had official contract with EMI / Harvest for another 2 years, but they agreed to publish with ELO in the same period. Aug. 1972 - Sept. 1973 .: 2 line up (Bev Bevan drums / vocals, Jeff Lynne guitar / vocals, Richard Tandy bass / vocals, Michael de Albuquerque bass / vocal, Mike Edwards cello, violin Wilf Gibson, Colin Walker cello). With "10538 Overture" climbing up the charts with rocket speed, ELO appeared on Top of the Pops with roadies (bearing masks) and the audience loved them and that meant their new debut was a reality at Reading Festival 12 Aug. 1972. The second album was first released in the US in February "ELO 2" and achieves 62 place. April 21, "ELO 2" had originally the working title "The Lost Planet". The second album is released in the UK in March "ELO 2" and achieves 21 space March 31 here. March 17 played ELO their first sold-out concert in Malvern Winter Gardens in Worcestershire, UK. Until then, they had never played for an audience that could fill an entire stadium. April 19 concert at London Palace Theater. June and July, touring in the US, 27 concerts in 40 days, beginning in Santa Brabara, California. After the tour is Wilf Gibson leaving the band. In September, was Colin Walker (the largest resentment was that he did not play on Elinor Rigby by The Beatles) leaving the band again to teach. Mik Kaminski replaced Wilf Gibson on violin from September to September 1986. Hugh McDowell also came back in September, replacing Colin Walker on cello. In November ELO published their 3 album "On the third day" in the US and obtains December 29, 52 place here. In November they also released the single "Showdown" / "Old England Town" on which Marc Bolan (T.Rex) plays guitar and made a bit on backing (he is not with the B-side), (later Showdown was an R & B hit for Candi Station, and November 13. it achieves a 11 place in UK). ELO gives a concert in Copenhagen Dec. 8. In December they published "On the third day" in the UK by Warner Bros.
January 25'th a concert at London Golders Green H'drome. In Febuar achieves the single "Showdown" which Marc Bolan (T.Rex) plays guitar throughout the song (he's not on the B-side "Old England Town") 53 place in US. In March released the single "Ma-ma-ma-Belle" which Marc Bolan (T.Rex) plays guitar throughout the song (he's not with the B-side "Oh no not Susan") and April 6 it achieves the 22 place in UK. April 20'th concert at the Capitol Theatre. May 25'th achieves the single "Daybreaker" an 87 place in the US. Louis Clark, born 27 February 1947 in Bedford is ELO's orchestra and choir co-arranger, conductor and stringsyntheizer player from September 1974 to September 1986. Sept. 1973 - Oct. 1974 .: 3 line up (Hugh McDowell cello, Bev Bevan drums / vocals, Jeff Lynne guitar / vocals, Richard Tandy bass / vocals, Mik Kaminski violin, Michael de Albuquerque bass / vocal, Mike Edwards cello). This line up recorded the live album "The night the lights went on in Long Beach" 12 May and which was only released in Australia, New Zealand and continental Europe in November. Because of the minimal conditions for the group as well as to the ambitions Lysol was not available in the UK, the ELO began to concentrate almost exclusively on the US market and tours as much as possible. As a result of that their fourth album "Eldorado" which was released in October sold to gold and achieves 16 place in UK. Also for the first time Jeff Lynne used a full orchestra and choir to establish the group's sound on "Eldorado" (a little hint of what may come in the future). The cover of "Eldorado" is from the movie "The Wizzard from Oz" on Danish "Troldmanden fra Oz" with Judy Garland starring as the girl Dorothy who dreams away to a mysterious land. It is Dorothy's shoes on the cover and the hands of "The wicked witch" ase she is goin' to steal Dorothy's red shoes. It was, Sharon Arden (now married to Ozzy Osbourne of Black Sabbath) that chosed the picture for the cover. In 1983 plays Bev Bevan in just Black Sabbath on a live tour. Sharon Osbourne is by the way, the daughter of manager Don Arden! Oct. 1974 - 4 line up. : (Hugh McDowell cello, Bev Bevan drums / vocals, Jeff Lynne guitar / vocals, Richard Tandy bass / vocals, Mik Kaminski violin, Kelly Groucutt bass / vocal, Melvyn Gale cello). In came Kelly Groucutt (one week he played in Sight'n'sound for a few uninterested audians and the next he played for several thousand wild fans in some of America's ampfiteatre) and Melvyn Gale previously played with London & National Youth Orchestra. Compilation album "Showdown" is published by Harvest in October, the album is a combination of singles and tracks from the first two albums. The single "Can not get it out of my head" from "Eldorado" where for the first time a 30-man string orchestra was used, will be the band's first top 10 in the US, it generates 9th place on March 15. After this, the band were almost on tour the hole year. "Face the Music" was published in October in the US and mostly was recorded at Musicland Studios in Munich, Germany, (also mostly of the group's future material were recorded here), the single obtains an 8 place in the US and was certified gold after a few weeks of publication. Giorgio Moroder is the founder of the Musicland Studios in Munich, a recording studio used by many renowned artists including Electric Light Orchestra, Led Zeppelin, Queen and Elton John. "Face the Music" were published Oct. 25 in the UK. The single "Evil woman" were published in November, "Evil woman" is the fastest song as Jeff Lynne has written, and it was done in the studio. The single "Evil woman" achieves Jan. 17'th 9 place in UK and Feb. 14'th 10 placet in the US, just as a successful the tour begins where the first laser light on stage were used. The single "Do Ya" achieves 24 place in UK. The single "Strange Magic" achieves 22 place May and 14 place in the US and in July 38 place in UK. ELO switch to Don Arden's record label JET and published only in the US, greatest hits album "Olé ELO" which achieves 32 place in the US. 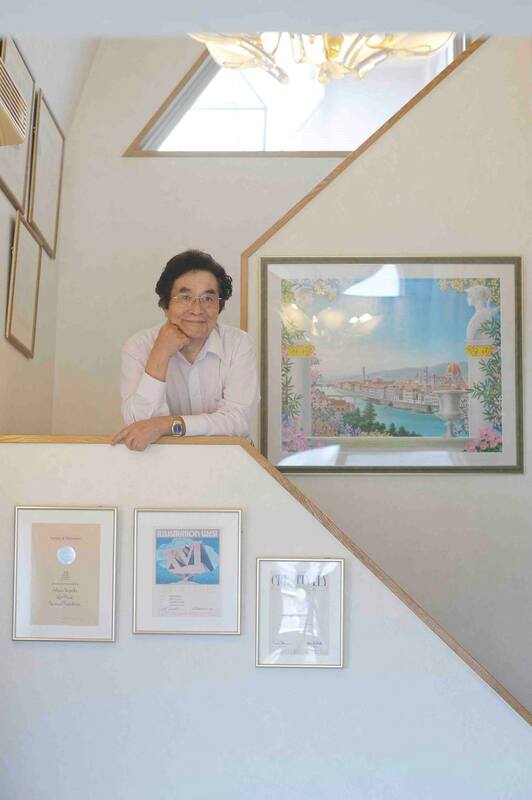 "A new world record" was published on December 4th and was selling over 5 million albums. On the album sings Mary Thomas the opera majority of "Shangri-La", while Kelly Groucutt did it live at the concerts. The lyric that is song at the beginning of the track "Mission (A World Record)" is "This is YERFFEJ ENNYL calling you from planet Earth"
NOTE: it is Jeffrey Lynne spelled backwards !!! The album of 1974 "Showdown" achieves a 59 placet in the US Aug. 7. The single "Livin 'thing" is published in October and achieves 4 place in UK. "Livin 'thing" achieves a 13 place in the US and the album "A new world record" remains on the US charts for over a year and have a 5 place in the US. ELO began a large tour Jan. 17 in the US and Canada, which will last three months until April 6. The single "Rockaria" is published in February and in March it obtains the 9 place in UK. ELO's version of "The Move's" only US hit is released on April 2 and achieves 24 place in the US after Todd Rundgren used it in a live show. The compilation "The light shines on" was published in April on Harvest, while Jeff Lynne shut themselves up in the Basin in Switzerland for writing songs for the next album. "A new world record" achieves 6 place in the UK 8 months after release and hereafter they started a world tour. The single "Telephone line" was published in June and achieves an 8 place in UK, September 24 it achieves the 7 place in the US and it made the band's first gold single. "Out of the blue" was published on November 12 and was pre-booked for over 47 million dollars, it achieves 4 place in UK. When listening closely to the "Mr. Blue Sky" which is the last number on page 3 you can hear "please turn me over" this was before the CD time and Jeff Lynne thought that if listeners were bored they would probably not also hear page 4, so therefore this request! The number "Sweet talkin' woman" had the working title "Dead end street", but it was changed when Jeff Lynne re-wrote the text. On the track "Summer and lightning" was a thunderstorm outside the studio in Munich recorded and used to track where it rained quite a lot during filming. The single "Turn to Stone" was published in November and achieves 18 place in UK. Dec. 10. "Out of the blue" achieves January 8'th 4 place in the US (when the album climbed the charts ELO shifted the US distribution from JET to CBS / Columbia and the band brings an action against United Artists, for having sold millions of illegal copies. The single "Mr. Blue Sky" is published in January. February 4 achieves "Turn to Stone" a 13 place in the US. In February ELO's biggest and most extravagant world tour began, it went under the name "The big night" in the US. They played eight sold-out concerts at Wembley Empire Pool in London. This was the tour with the giant laser show and the band was in a spaceship (to over 250.000 pounds) and played for a total of over two million enthusiastic fans. At this time it was the biggest ever and most spetaktlære in live concerts as the rock world had seen !. The intense piece of music that starts Wembley concert, is the last minutes of the First movement (Lacrymosa) of Benjamin Britten's Sinfonia da Requiem, Op. 20. With the tour had ELO an opening band "Trickster", which was founded by Phil Bates which much later became the lead singer of ELO pt. 2. 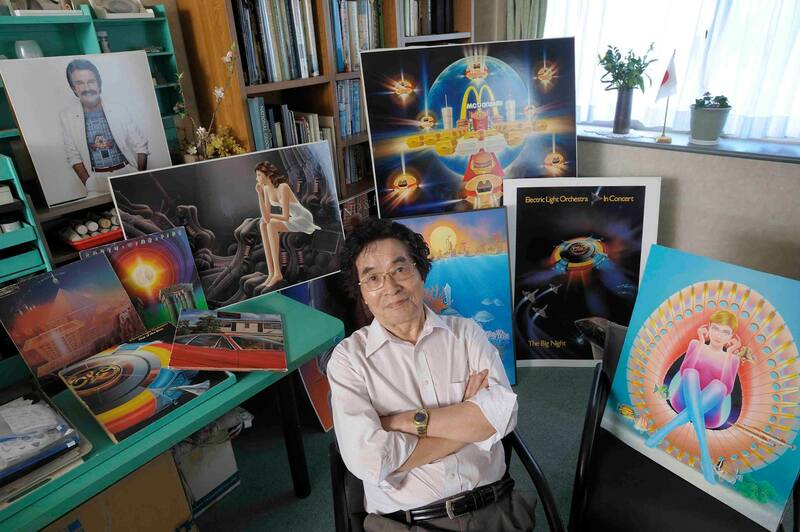 The illustrator of the "Out of the Blue" artwork 79 years old Shusei Nagaoka has sadly passed away, R.I.P. 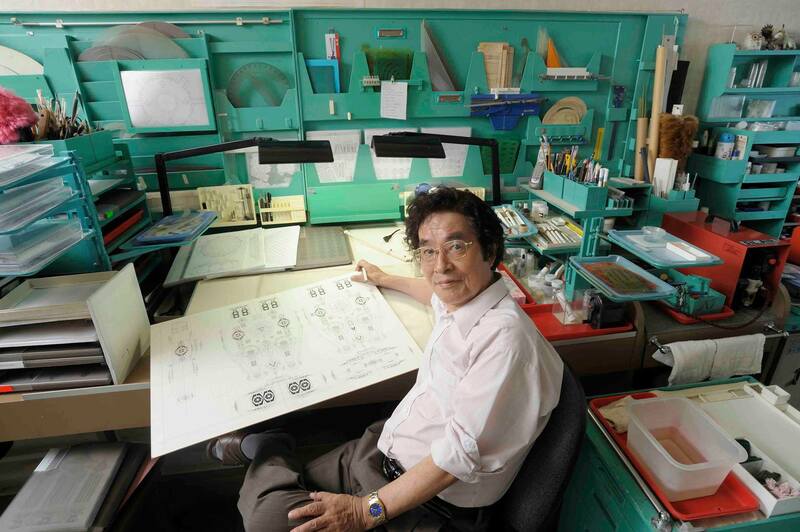 Shusei Nagaoka, teacher has passed away at 1:00 am June 23. It was a myocardial infarction. 1970 in he did a lot of different works among Album covers such as Earth Wind & Fire and ELO, it was make yourself your success. "Mr. Blue Sky" achieves February 25'th 6 place in UK. The single "Sweet talkin' woman" achieves a 17 place in the US April 29'th. The single "Wild West hero" is published in June and obtains June 24 a 6 place in UK. "Mr. Blue Sky" achieves August 12'th a 35 placet in the US. "Sweet talkin' woman" achieves a 6 place in UK Oct. 21 and will be the 4 hit in UK from "Out of the blue" album. November 18 achieves "It's over" a 75 place in the US. The 3 dobb. JET box "Three lightyears" is published in November (On the third day, Eldorado and Face the music). December 16 achieves the EP 7" "The ELO EP" a 34 place in UK ("Can't get it out of my head," "Strange Magic," "Ma-Ma-Ma Belle" and "Evil woman"). Jeff Lynne released a solo single "Doin' that crazy thing". Bev Bevan released a solo single, "Let there be drums", that does not come on the charts. The 3 dobb. JET box "Three lightyears" achieves January 6'th a 38 place in UK.UKEngland. The compilation "The light shines on, vol. 2" published in March with very little success. The single "Shine a little love" is published in May and achieves a 6 place in UK. May 4 becomes ELO honored with the award Outstanding Contribution to British Music at the Ivor Novello Awards. "Discovery" is published in May and the group's first top 1 in UK June 2. The single "The Diary of Horace Wimp" published in July and achieves an 8 place in UK. "Discovery" scores 5 July, a 5 place in the US. The single "Don't bring me down" is published 20 July. The single "Shine a little love" achieves 21 July an 8 place in the US. The single "Don't bring me down" achieves the September 3rd place in UK and on September 8 an 8 place in the US which is the band's biggest single success in the US. "Confusion" achieves 17 September a 37 place in the US and an 8 place in UK in November. "ELO's greatest hits" achieves 18 December a 7 place in UK and a 30 place in the US Dec. 22. "Last train to London" achieves Feb. 2 a 39 place in UK. In May the closed a deal to write songs for the upcomming movie "Xanadu". First release from the soundtrack is "I'm alive" and it achieve a 18 place in UK. Tittel song "Xanadu" is sung by Olivia Newton John and this is ELO's first top 1 single in UK in June and 11 October, an 8 place in the US. The soundtrack of "Xanadu" is published in July and made a 2 place in UK and a 4 place in the US, although the film is a big flop. "I'm alive" achieves July 12'th a 16 place in the US. "All over the world" from Xanadu gain in August a 12 place in UK and 4 October, 13 place in the US. "Don't walk away" from Xanadu made Dec. 6, a 18 place in UK. May 19 wins Xanadu, Best film song, theme or score at the annual Ivor Novello Awards lunch. In July is the album "Time" released and it topped a British charts, and achieves a 16 place in the US. On the track "Yours truly 2095" is Sandi Lynne (Jeff Lynne's ex. wife) who is singin' the phrase "Is that what you want". The single "Hold on tight" achieves Sep. 5 a 4 place in UK (for the first time a record is released under the name ELO (they however, returns to the full name in 1986 when they switch to CBS / Epic). October 3 achieves "Hold on tight" a 10 place in the US. The band is now starting a great tour that brings them through the US, UK, Norway, Sweden, Denmark (February 7, 1982), The Netherlands, Belgium, Germany, France, Switzerland and Austria. For the first time since the beginning of the 70s, they play not sold-out concerts! David "Dave" Morgan is ELO's backing vocal, vocoder and acoustic guitarist for live concerts until sept. 1986. November 7 achieves "Twilight" the weakest performance on the UK charts for years the 24 place. November 28 achieves "Twilight" a 38 place in the US. January 30 achieves the double A side single "Ticket to the moon / Here is the news" a 20 place in UK. March, for the first time since "Night Rider" six years earlier, has a single ELO not entered the English or American charts "The way life's meant to be". In April published Dave Edmunds' the album "Information" that has Jeff Lynne as producer. June achieves "Rock'n'roll is king" a 13 place in UK. In June published "Secret messages" and achieves a 4 place in UK and a 36 seat in the US. Originally it was planned that it would be a dobb. album with the following Playlist: A side: Secret messages / Loser gone wild / Bluebird / Take me on and on. B side: Stranger / No way out / Beatles forever / Letter from Spain / Danger ahead. C side: Four little diamonds / Train of gold / Endless lies ('83 version) / Buildings having eyes / Rock'n'roll is king. D side: Mandalay / Hour after hour / After all / Hello my old friend. We must hope that it will be released at some point. August 20 achieves "Rock'n'roll is king" a 19 place in the US. In September achieves the single "Secret messages" a 35 place in UK. October 8 achieves "Four little diamonds" an 86 place in the US, this will be the group's last hit in 2 years. Bev Bevan leaves ELO to play with Black Sabbath (but comes back again to the next album), replacing Bill Ward, who had health problems. October 22 Kelly Groucutt is leaving the band. Inconsistency about his salary. Jeff Lynne's second solo single "Video" from the soundtrack of "Electric Dreams" is published. In September produces Jeff Lynne 6 tracks for Dave Edmunds' "Riff Raff". In January joins Martin Smith as backing vocal and on bass guitar on the "Balance of Power" tour. In march published ELO their last album "Balance of Power". March ELO changed their record company to CBS / Epic and is now reduced to three members Jeff Lynne, Bev Bevan and Richard Tandy. The single "Calling America" gains in March a 28 place in UK. March 15 ELO appearing for the first time in 4 years in their hometown Birmingham, it happened with thee Heartbeat charity show, Bev Bevan was the organizer of the show that was to raise money for a children's hospital. The show was sold out and became one of the great events on the English rock scene. George Harrison was the special guest star on stage and others who played was: The Moody Blues, Robert Plant, UB 40, The Roy Wood Band and of course ELO. April 5 achieves "Calling America" an 18 place in the US. The album "Balance of Power" achieves a 9th place in UK and a 49 place in the US. The singles "So serious" & "Getting to the point" did not enter the charts. July 13 gives ELO the very last concert that took place in Stuttgard, Germany and shortly thereafter dissolves Jeff Lynne the band. Jeff Lynne produced a track on "Duane Eddy" wich is Eddy's comeback album. Jeff Lynne has always been a big Beatles fan and has been working with George Harrison on his "Cloud nine" album. It contains the song "Got my mind set on you" produced by Jeff Lynne, this number achieves a 1 place in the US and a 2 place in UK. Jeff Lynne is helping to write and produce "Let it shine" with Brian Wison on his debut album "Brian Wilson". Jeff Lynne is now concentrating a great deal on a career as a producer. He helps with Randy Newman's album "Land of dreams". He has great success with the relaunch of Roy Orbison's album "Mystery girl" wich turns out to be his last album, the album contains the world hit "You got it." October published "The Traveling Wilburys album no. 1" plays Jeff Lynne with Bob 'Lucky' Dylan, George Nelson 'Harrison, Tom' Charlie T. Jr. 'Petty, Roy 'Lefty' Orbison. Jeff Lynne and George Harrison co-produces the album. Single release from the album is "Handle with care" "End of the line". Nov. 22, a press release of Jet Records apears, it says that it was Jeff Lynne who dispersed ELO, but it was only he who left the band. Jeff Lynne is helping to write and produce Tom Petty's "Full Moon Fever", while also the last recording of Del Shannon. December 23 achieves Telstar release "ELO's Greatest hits" a 23 place in UK. Jeff Lynne produced two tracks for Roy Wood for later release. Having had success with writing and producing for others the last 10 years, facing Jeff Lynne now spotlight to himself with a solo deal with Reprise company. The first fruit of which is the single "Every little thing" that achieve a 59 place in UK. July 21 achieves Jeff Lynne's solo album "Armchair theater" an 92 place in the US and a 24 place in UK. Double album "Afterglow" is published, with the best tracks from ELO and Div. B-sides from 1981 to 1986. In October was "ELO's Greatest hits" relaunched as "The very best of The Electric Light Orchestra" and this achieves now a 28 place in UK. March brings Bev Bevan a number of musicians together and is starting a world touring under the name ELO part two. Jeff Lynne was producing "Into the great wide open" for Tom Petty & the Heartbreakers. ELO's "Greatest hits volume two" were broadcasted. ELO's two live album "Live at Wembley" and "Live at Winterland" is published. Live at Wembley is the same as in the 1980s, was released on video in which Tony Curtis who speaks the intro. Same is later released on DVD "Live at Wembley". 15 years have passed away since the last ELO album and in November there is a release from Jeff Lynne a 30th Anniversay album "Flashback". This 3 dobb. CD contains many remastered tracks and new and never before released material. After years of waiting on a second solo album from Jeff Lynne, there are spread rumors about an upcoming album called ELO. April 20 occurs ELO live for the first time in 17 years, it takes place in New York in connection with VH1 Storytellers. About 40 ELO fans are invited to the recording. Line upen is Jeff Lynne & Richard Tandy (from the original ELO) and Rosie Vela, Marc Mann, Gregg Bissonette, Matt Bisonette, Peggy Baldwin, Sarah O'Brien and 'Nika' Nancy. May 23 and 24 they performed again in the CBS studios in Hollywood, this concert is released later as the DVD "Zoom". June 8 is ELO's VH1 Storytellers show played all over the US. June 12 released the album "Zoom", the first ELO album since "Balance of power" 15 years ago. Sales of the album is slow. Ringo Star is playin' the drumms on "Moment in Paradise" and "Easy Money" on the album "Zoom" of "The Electric Light Orchestra". In June, Jeff Lynne and Rosie Vela is in Rock Line. Jeff Lynne makes a show called "off the record" with Joe Benson. Other ELO related radio shows were made worldwide to promote the new album. 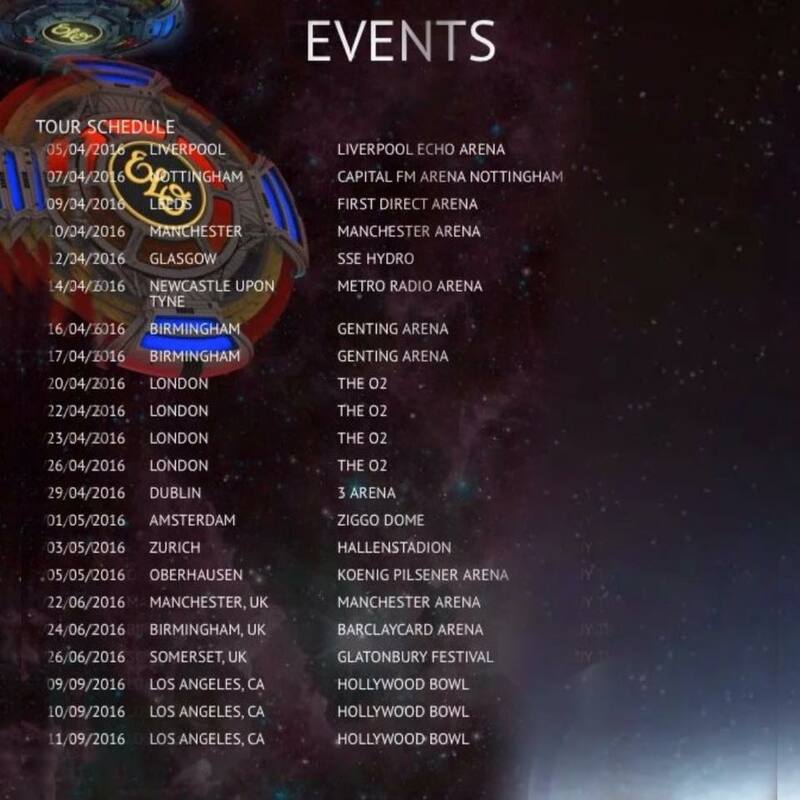 In July, Jeff Lynne is planning the biggest tour since Out of the blue tour in 1978 to start in September. This show would include a new spaceship and laser show along with a new line up. Only Jeff Lynne and Richard Tandy is from the original ELO. In August / September thet played the show which was recorded in May across the US. November 13 released the DVD "Zoom". February is ELO's remasters series stopped and perhaps even canceled. Oddly enough, nothing has been heard from ELO's management about a new tour! November 29 is exactly one year after George Harrison's death most of the rock scene came together to give a memorial concert at the Royal Albert Hall in London, UK. Jeff Lynne plays on stage with Ravi & Anoushka Shankar, Tom Petty, Eric Clapton, Ringo Star, Paul McCartney, Monty Pytons Flying Circus and many more. The album "Concert for George" will be released. November 18 allmost a year after the memorial concert released the DVD "A Concert for George", Jeff Lynne has produced the audio part on the set. In March insert Jeff Lynne and Tom Petty, (deceased) George Harrison at the Rock and Roll Hall of Fame in New Yourk City Waldorf Historia Hotel. Jeff Lynne and Tom Petty plays two George Harrison songs, "Handle with care" and "As my guitar gently weeps". Prince are also invited to play with them on stage. DVD "Inside The Electric Light Orchestra 1970 - 1973" is published, it contains goodies from the last Move and the first ELO. In September releases the remastered CD of "A new world record" which contains a previously unreleased track "Surrender". "Surrender" is published as a promo single CD and sent world wide to radio stations and DJ's. After that it's released only as a download on Itunes where it achieves a 81 place on the US the top 100. More remastered versions of "A new world record", "On the third day" and "Face the Music" contains all news and unreleased material were relesed. Jeff Lynne goes back to court and wins this time ELO name back from ELO pt. II, they must then call itself "Former members of Electric Light Orchestra". In February released remastered versions of "Out of the blue" and "Ballance of power" both contains news and unreleased material, the brand new track which is also published as a promo single "Latitude 88 North". "Mr. Blue Sky, The Very best of Electric Light Orchestra" was relesed, Jeff Lynne has made all the tracks over again and made a brush up to 2012, with the tekniq that is avalible today. Jeff Lynne relesed a new solo album "Long Wave" wich contains Jeff Lynne's versions of different songs that he has a special connection to. Jeff Lynne plays live as The Electric Light Orchestra for the first time in 28 years, it happend sep. 14 at Hyde Park in London, UK. It was a festival arranged by Radio 2. The concert were broadcasted live on the internet. The audience of over 50.000 were ekstatic. In an interview afterwards Jeff Lynne tells that he have a plan of a world tour, in near future. 24. Sep. Jeff Lynne released a new track "When I was a boy" from his fortcoming album "Alone in the universe" wich is released on 13. nov. 2015. "Alone in the universe" was released 13´th November 2015 and became the 18´´th most sold album in the UK in 2015. Jeff's daughter Laura Lynne sings the backing vocal on "Love and rain" and "One step at a time". Can't wait to see Jeff and band in Oberhausen. You can check my video of the Hollywood Bowl concert, here. Webmaster: Ken Stavensoe Nielsen, 12-09-2017.